July 15, 2010 — The two-wheel community in the Twin Cities is as varied as it is awesome. One of my favorite local shops is Bluecat Motors in St. Paul. It’s an unassuming little shop nestled in the shadow of an old water tower, in one end of an old warehouse, in the old industrial part of town. The reason I appreciate Bluecat Motors so much is their complete lack of snobbery. If it’s got two wheels and a motor, they’re into it. They’ll work on it. They’ll help you find parts for it. 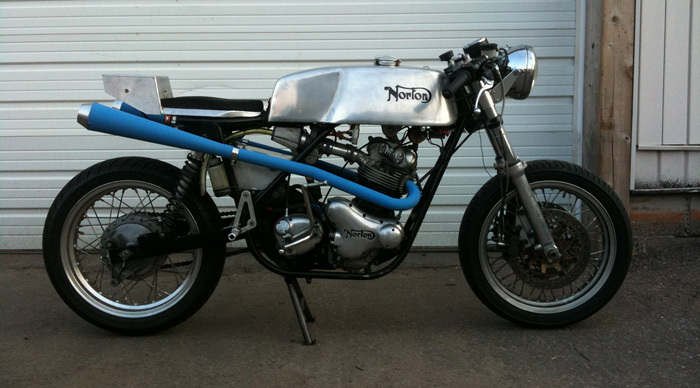 They’ve got their specialties — cafe racer conversions, near-vintage Japanese and British motorcycles — but even if you’ve got something weird and old they’ve never seen before, they’ll at least try to help you out with it. Bluecat is also one of the only places I know of where you can find restored Lambretta scooters on the showroom floor. Beyond their sales and service, Bluecat is a perenial major sponsor of the Rattle My Bones scooter rally, the local Mods and Rockers event, and the Bearded Lady Motorcycle Freak Show. Recently I discovered that Bluecat started doing a Third Thursday event this year, so this week I hopped on my CB650 to check it out. To understand the genesis of the Third Thursday event, you have to know about another event: First Thursday in Minneapolis. I haven’t yet attended, but on the first Thursday of every month, at Dulono’s Pizza in Uptown, hundreds upon hundreds of bikers swarm the scene. I’m told it’s an absolute madhouse. It’s a mob of people and bravado and bikes — a real anything goes sort of situation. It’s on my list, but I imagine it’s not the kind of event that I’d enjoy too often. Third Thursday at Bluecat Motors is billed as the antithesis of that scene. It’s a much more casual get together, of fewer bikes, and a very relaxed atmosphere. 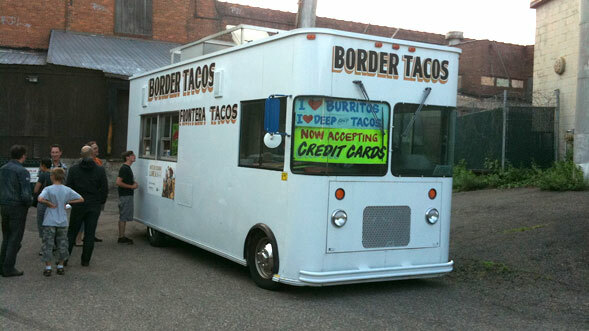 There’s usually a taco truck to feed everybody and Relic is around to pinstripe your bike on-site if you so desire. It sounded like a fun time, so after several days of dedicated wrench work on my Honda, I was ready to make an entrance. This would be my first real ride with the new bikini fairing in place, which I was excited for. Would it make any difference? Would it stay put? Would it be noisy or put the wind up my helmet in some weird way? I shot up Hwy 35E toward St. Paul and was very pleasantly surprised at how much that little fairing took my torso out of the wind. Rolling at 70 mph was so much more comfortable without the buffeting wind in my chest the whole time. What’s more, I can easily and comfortably duck down behind the windscreen. My freshly changed air filter had amplified the already distinct whine of the intake tract and added a noticeable amount of zip to the throttle — all now much easier to hear with a good deal of the wind noise quieted by the fairing. As I pulled into the Bluecat lot, I saw about 35 bikes ahead of me loosely parked in three rows. I coasted up, my inline four whisping and growling under me, and came to a stop beside a great ’70s era Honda cafe. There were three guys just the other side of it, bottles in hand, checking out the bikes around them. As I rolled in, I couldn’t help notice them notice me and my bike. Through the last sputters of idle and even my helmet and earplugs I heard one of them lamentably say “Yeah, that’s what my bike’s gonna look like.” I pulled off my helmet and stuffed my gloves inside it. I looked over, nodded hello, and there they were — still ogling my CB650. As groovy as I think my bike is, the idea that strangers would think it’s cool hadn’t even occurred to me. I set the bike on its side stand and dismounted. They were still checking it out. I couldn’t help but think this must be kind of what it’s like to be a good-looking lady. As I walked out into the pack of parked custom mopeds and tricked out old UJMs, I glanced back at my bike. 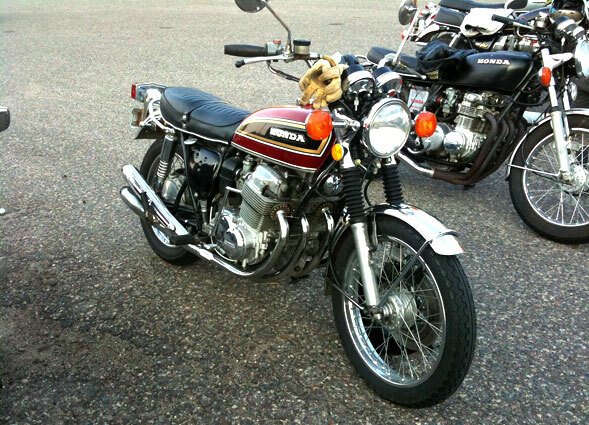 My Honda CB650 is far from the grumpy, raspy, neglected thing it was when I bought it. With its maintenance up to date, its carbs synced, some ill-fitted accessories removed and the new fairing fitted, it’s turned out to be a hell of a machine. Seeing it with fresh eyes, I realized, yeah, that’s a damn good-looking bike. I didn’t take five steps before I ran into some of the usual suspects from the local scooter crew. Excluding work people, I can count on one hand the number of people I know in the Twin Cities who don’t have two-wheeled mischief of one variety or another. It’s become my favorite thing about living here. Not only are there so many great places to ride, but there are great people to roll with. I was also very pleasantly surprised to see that some of my scooter buddies had also made the jump to motorcycles, just as I had. 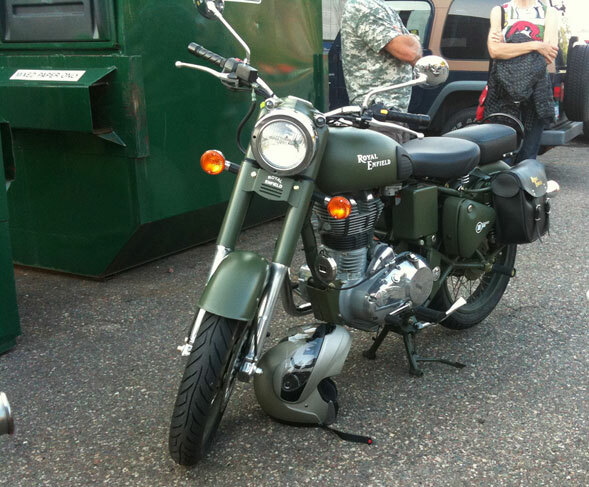 Fellow RMB rally volunteer Joe had ridden his new Royal Enfield Bullet 500 — a lovely retrospective english bike. His wife was on her new SYM Symba (a Honda Super Cub clone). Soon Pooter showed up on his motard and even Dave Harrington rolled in on his scooter after not long. I hadn’t expected to know anybody at this gig, yet here were so many fun scootheads — here to check out the bikes, the tacos and the chill atmosphere. It was such an eclectic mix of people and machines that the whole thing was downright charming. There was a whole pack of souped-up mopeds, the occasional new-school Triumph, a couple Harleys, and a lot of old Jap bikes like mine. Great stuff — this is going to have to become a regular thing. I couldn’t stay long. The sun was getting low in the sky and since The Mrs wasn’t with me, I wanted to head home. 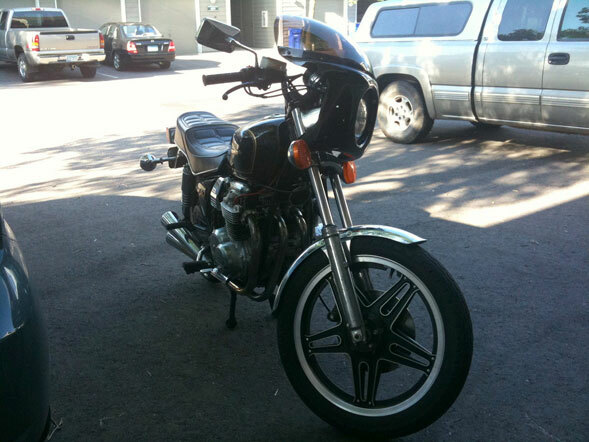 Just as I fired up the CB650, Ryan, the owner of Bluecat Motors, came by on his way to another bike. We couldn’t talk too well since my earplugs were in and my helmet was on, but it was good to see him again. He’s the one who got me into this stuff, after all. Him and his groovy little shop. On my way down the connecting street, I gave the CB650 the customary too much throttle — making my motorcycle exit in a loud howling roar of four Japanese cylinders for everybody in the lot to hear. Damn, it sounded good.